Premium Colored Car light bulbs, give your car a distinctive look! PlasmaGlow's Premium colored car light bulbs are the best thing that ever happened to your car! These high output bulbs are direct replacements for the bulbs already in your car and install in minutes. No extra upgrades are needed, just install them, and you?ll see a unique look you never thought possible from your vehicle! 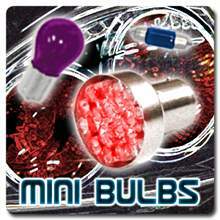 These colored car light bulbs can be used for your "park lights", "interior lights", etc... Can even be used for motorcycle lights. Stand out in the stream of traffic with your choice of colored light bulbs. The colored light bulbs for cars below all come in 5 vibrant colors to match with the color and personality of your car. There is also a choice of LED colored car light bulbs below too, for a really cool "Bright colorfull look". All PlasmaGlow's colored car light bulbs carry a manufacturer?s 10-Year Replacement Warranty, the longest in the industry! Below, you will find the most common stock wiring harnesses for Premium colored car light bulbsto fit your car. Simply go to your car and check the numbers that are on your existing bulb light harness, (the plug that plugs into the actual light bulb assembly). This is a "stock harness". Once you've made a match with the premium colored car light bulbsbelow and your existing headlight stock harness, simply click on the PayPal *Add to Cart* button, for that particular item. On Special This week Only Hurry! Fits any 3022 stock wiring harness! No modifications needed! Fits any 1156 stock wiring harness! No modifications needed! Fits any 194/168 stock wiring harness! No modifications needed! Premium Colored Car light bulbs- Back to Home Page.